I'm sad about this. I mean, I do like Bloglovin' as a reader, but I just found google reader had so many great features and stats to look at. Like- I can differentiate between blog followers and blog readers on google. On Bloglovin it only appears to show blog followers. Organizing on reader just seems so much easier. It all just feels like I'm starting over again with growing my blog, and relearning everything. sigh. I don't know why I care about this so much. It kind of feels like I moved from a rural school with lots of friends, to a big city school where I need to start over again. I know....first world problems. sigh. It's as bad as the photos and news reels show. I don't need to post any more. We live in the high and dry area of Calgary that has not been affected. We are so thankful for that, yet a feeling of guilt and sorrow for others who are not so fortunate. 100,000 people in the city of Calgary alone were evacuated. Other towns in the surrounding areas have been devastated and are still completely under water. People have lost everything. Schools have been cancelled since Friday. They NEVER shut down schools here - even in blizzards and -40 temps. :( My sons are very upset, because they have no idea if their teachers have been affected. Little Cameron wants to know if Ms.N is okay...if she has a home to live in. :( Breaks my heart. My city community is strong, and the outpour of help and strength of our people shines through. Out of the approximate 100,000 people - only 1500 had to be housed in shelters...everyone else had a place to go to through family, friends and community efforts. You always see other communities in trouble, via hurricanes, tornadoes, flooding, etc. You feel awful for those people, you gasp at the television and watch in horror - and when it becomes your own community it becomes so very real. Of course, quilters are coming together to contribute to the families in Alberta. If you have quilts or quilt tops to donate, please contact me and I can give you details of where to send them. We are working together with the quilting shops in our community. We have a team of longarmer quilters, piecers, binders to make sure we have as many quilts as we can provide to our families affected. I will be providing my longarm quilting services for free to quilt as many tops as I can. My client S came by to share this amazing treasure she found in a family member's closet. A lump of something in an old pillowcase....when she opened it up, you can imagine the shock and awe....included with this gem was a hand typed card...describing who the quilt was made by, made for, and when it was made - in 1891. She graciously allowed me to take a few photos so I could share with you....the blocks are just so delicate and amazing attention to detail that I just HAD to share it with you! hand embroidered pictures...using ultra fine threads. Some of the work, I had to touch to see if it was a pencil mark or thread....nope, it was thread. look at the detail on the faces! yep...thread! this one i couldn't get over - it was so so delicate. it looked like a pencil had finely sketched this butterfly...but on close examination, it was hand stitches using very fine thread - silk I think. What we discussed was how to preserve it from disintegration - but enjoy it too without keeping it wrapped and hidden away! Thoughts? Totally totally humbled by this today. It's not all glorious swirls and feathers you know. I loaded a quilt on my machine with the backing going the wrong way....ending up with a backing 8 inches too short. Someone told me it was a Rite of Passage. It gave me a good excuse to listen/watch trashy daytime television while I was ripping out the stitches. sigh. But I did learn a trick! Here's one for you too! All of those little threads that are still stuck in the fabric here and there...use a silicone spatula! rub the surface of the fabric/seam whever you have the little bits...and they will come flying off beautifully. See? they all landed on my carpet. Hi everyone, thanks for playing! Here are the winners! Cool idea for the frames. My choice would be Wonderland by Momo, though it was a hard decision! I'd be happy to take either and make up into a charity quilt. Please email me your mailing address so I can send these out. Thanks! Auditioning fabrics for a quilt - and a giveaway! ...or...how I accidentally discovered a cool way to audition fabrics for a quilt. I've got a few of these collage photo frames hiding in closets around the house - great intentions to fill them with photos, but alas...I find the photos look so cluttered. So, I thought fabric samples would look uber cool in a collage for my studio. And they do! This would be an easy way to audition prints that you are unsure of - place them together in a collage like this and see how they work for a quilt! As I have been sorting and cleaning out closets, I cam across these two piles of bee blocks that I know I will never put together. Sad, I know...but I just won't. So, if you are interested , let me know which one you would like, and I will draw a winner in a few days! No special comments, no 'subscribe' to my page (but please do if you want) no facebook links. Just a giveaway. That's all. I'll draw a winner in a few days - please make sure you are not a 'no reply comment' person! The fabrics in these blocks are all Denyse Schmidt - these are rectangular blocks. These fabrics are all Wonderland by Momo - Moda. contest for giveaway now closed....winners announced on next post... thanks! My friend Lee gave me this quilt to play on awhile ago. I decided to try out my feathers on a real quilt, rather than just on practice pieces. Truth be told, before this, I was not a huge fan of feathers. But as I was building them, I started brainstorming and could envision feathers paired in some pretty funky settings. I like the movement they create. I started with a wavy horizontal spine and went from there. Each row of feathers is in a different direction. Where there were bigger gaps, I could have left the gaps empty,but decided to fill with some larger pebbles. 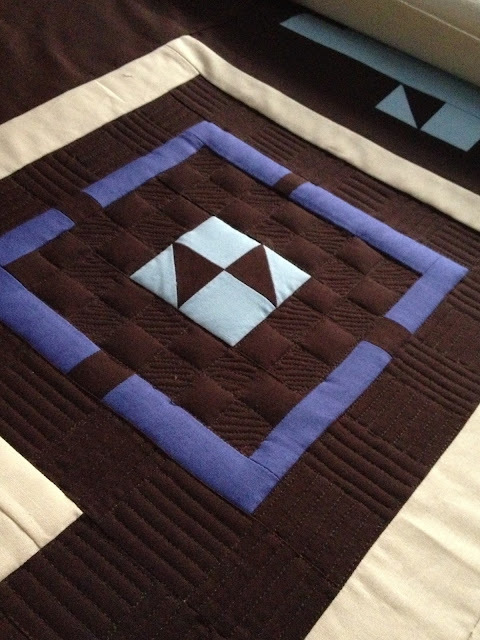 I am smitten with how quilting can make an ordinary quilt look extraordinary... I love my new job!!! Hard to find a good angle to photograph so you can see the feathers...but hopefully you get the idea! I definitely have a lot more to learn and practice with feathers. They are actually a lot of fun to create. My next trial will be spineless feathers - where they go in all directions and just fill the space. Thank you Lee, for bring this quilt for me to experiment on!